There are number of simple household items like fruit cans, water bottles, bath towel that can be used as tools for building stability, muscular strength and endurance. 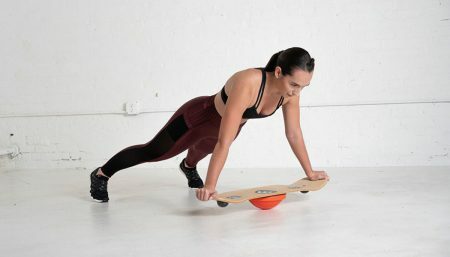 Using this basic tool, along with a floor that allows for sliding, can be a creative, effective and inexpensive way to get a killer workout! Bow-and-Arrow: Hold a towel at your shoulder level in front of chest. Tighten the entire body and pull against towel. Release. Move left arm to 45 degree position and tighten the entire body and pull against towel. Release. Extend left arm to full extension and tighten the entire body and pull against towel. Release. Repeat with the right arm. Triceps Pull: Stand with feet hip width apart, knees soft, holding one end of the towel with left hand. Extend left arm up and bring towel behind back so that it lines up with your spine, bending left elbow. Bend right arm behind back and grasp the towel at your lower back. Hold right arm steady and slowly extend left arm up to ceiling (pull harder for more resistance, lighter for less), then bend back to start. Repeat 10-12 times on each side for up to 3 sets in total. Biceps Pull with Towel: Step onto one end of the towel with your right foot, grasping the other end of it in your right hand (palm facing in front of hip facing outward). Keep feet slightly apart, knees slightly bent. Allow enough tension to feel resistance as you curl your right hand in towards your chest. Hold (with tension) at 90 degrees for 30 seconds. Step further away and hold at 45 degrees for 30 seconds. Switch sides and repeat for one set. Behind Neck Shoulder Pull: Stand with feet 12 inches apart. Hold towel with hands 12-18 inches apart. Position towel high on your neck. From this position tighten the entire body and pull against towel. Hold 10-12 sec and release. Keeping towel in back of neck, raise to a couple inches above head and tighten the entire body and pull against towel. Release. Raise towel to full arm extension while still keeping towel as far back as possible. Tighten the entire body and pull against towel. Release. Inner Thigh Stretch: Lie on your back with knees bent. Wrap towel around right foot and extend leg up to ceiling as straight as possible, holding onto both ends with right hand. Slowly open right leg out to the side, pressing left arm into the floor at the side of shoulder to counterbalance body. Open until you feel a stretch in the right inner thigh, without letting left hip lift off the ground. Hold for up to 30 seconds and then switch legs. Rocking Cradle: Lie on your back, with knees bent, feet lifted, ankles crossed and knees open to the sides. Hold onto towel folded lengthwise, with hands wide and use it to cradle your head. Lift head and shoulders up off the floor and gently rock to left shoulder and hip, until left elbow touches the floor (contract abs for stability). Quickly shift to the right side. That’s one rep. Repeat up to 3 sets of 10 reps.
Lunging Row: Begin standing with right foot in center of towel, left leg staggered behind, hands holding each end of the towel evenly. Bend both knees to lower into a lunge, then hinge forward from hips (keep back straight) and pull ends of towel (grasp lower on the towel for more resistance, higher for less) towards body, keeping elbows close to sides, squeezing shoulder blades back and together. Hold lunge and continue pulling towel as hard as you can for 30 seconds then switch legs and repeat. Repeat for 2 more sets on each leg. Be sure to keep spine naturally straight, abs tight and front knee over heel. Pull down: Stand with feet hip width, knees soft, holding onto the towel with hands slightly wider than shoulders. Reach arms overhead (the towel should be slightly in front of body) and pull towel tight. Brace abs in and pull towel into chest, bending elbows and pressing shoulders down back while lifting heels off the floor, balancing on the balls of feet. Return to start. That’s one rep. Repeat 15 times for up to 3 sets in total. Towel Teaser: Sit with knees bent, towel wrapped under knees, holding both ends with arms bent by sides. Brace abs in tight and lean back slightly to lift feet off floor (body should resemble a ‘V’ in this position). Slowly lower back to floor and extend legs out at a 45-degree angle (keep holding onto towel for support). Lower until back touches the floor (head and shoulders stay lifted). Hold for 1 count, and then use abs (towel assists) to sit back up to starting ‘V’ position. Do 10 reps. Sitting Side Row: Sit with knees bent, feet flat, holding towel pulled tight overhead. Brace abs in tight and hinge body back while scooping towel down to right side of body, tracing a circle from back to front. Bring body back upright as towel circles overhead (that’s one rep), then immediately repeat hinge and scoop down to left side. Do 20 alternating circles. Do try these excellent tone up exercises you can try at home or the gym.